The Battle of Yorktown, also called the Siege of Yorktown, fought from October 6–20, 1781, is considered the last major land battle of the American Revolutionary War. F The Continental Army, led by General George Washington, won a decisive victory against the British army, led by General Lord Charles Cornwallis. Cornwallis was forced to surrender after being surrounded by Washington's army. The Americans were assisted by the French, led by the Comte de Rochambeau. 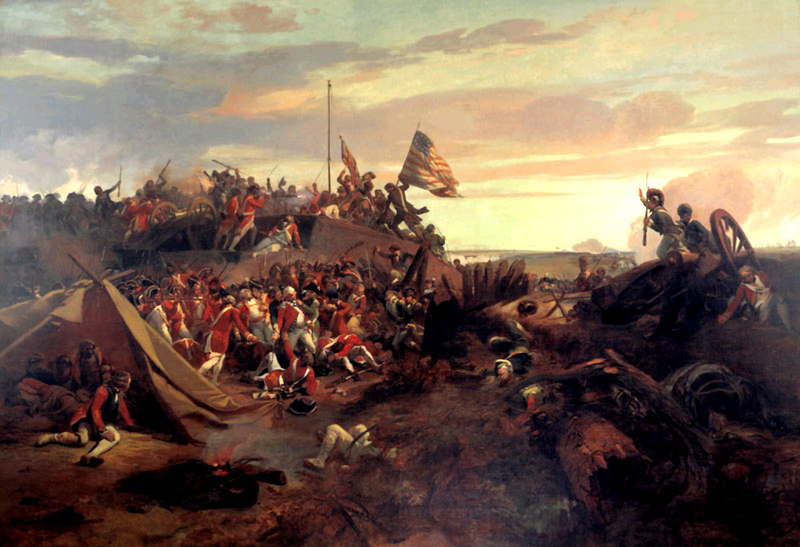 The battle took place in Yorktown, Virginia, near the York River. After the French fleet defeated a British fleet, Cornwallis was cut off and had to surrender to the French and the Continental Army. Eventually, it led to the Treaty of Paris in 1783, two years later. British General Lord Cornwallis had fought against the Americans in 1776 and 1777. He was convinced the Americans could not defeat a British army in the field. In 1778 he returned to England to care for his wife who died in February of 1779. After a few months he returned to America to continue fighting the Americans. While he was gone, there was a change in British strategy. While before the British had concentrated on defeating and destroying Washington's army, now since the French had joined the Americans, it was no longer a rebellion but an international conflict. The French had been helping the Americans with loans and war supplies. Now they were actively fighting the British. England decided to pull some troops from North America to defend its interests elsewhere. The new focus was on winning back the Southern colonies beginning with Georgia. The British thought that as many as 50 percent of the population in the South was loyal. They would start with Georgia and move north through The Carolinas to the Virginia Colony. On his arrival in New York City, Cornwallis was made second-in-command to General Henry Clinton. The two generals did not trust each other. Clinton was convinced Washington would attack him. He was afraid of sending troops home and having to depend more on Loyalist militia. Cornwallis was ready to go ahead with what troops he had. Clinton was suspicious Cornwallis' return from England was to get a command for himself. In fact, Cornwallis had secured a commission to replace Clinton should Clinton repeat his threats to resign again. Clinton sent Cornwallis south to recapture Charleston, South Carolina following the new plan. But almost immediately, Cornwallis began acting independently of Clinton while the latter stayed safe in New York City. Cornwallis wasn't going to play it safe and advance by careful steps as he had been instructed to do. When he saw a chance to attack the new patriot army under Major General Horatio Gates, he did so without orders nearly wiping out the Americans. Cornwallis moved carelessly leaving American bands such as the one lead by Francis Marion (called the "Swamp Fox") in his rear. The American general Nathanael Greene noticed this right away and broke up his command into smaller units to plague Cornwallis. Finally the two armies met at the Battle of Guilford Court House, which neither army won. All the while Cornwallis was not sending messages to Clinton telling him where he was. After Guilford Court House, Cornwallis moved to the coast of North Carolina to rest his men. Then, without orders, he decided to march north to Virginia. Frustrated by this Clinton sent Cornwallis a number of contradictory messages, most worded as suggestions rather than orders. But he did order Cornwallis to find a defensible position where he could be evacuated by the Royal Navy possibly to Philadelphia. Cornwallis decided on the community of Yorktown and his men started building defenses there in August of 1781 to wait for the Navy. In New York, Washington learned that the French Admiral François Joseph Paul de Grasse was sailing north from the West Indies. Rochambeau convinced Washington they could attack and defeat Cornwallis. The two commanders began marching south to meet de Grasse's 27 ships and 3,200 troops. Clinton learned of this and sent a British naval fleet to the Chesapeake Bay to cut them off. But the French and Americans arrived first. In the Battle of the Chesapeake the French navy forced the British ships back to New York City. Clinton warned Cornwallis in early September he would soon be facing American and French troops but promised him reinforcements by sea. Clinton had not yet learned of the French naval victory and did not know he could not rescue Cornwallis by sea. By the end of September, Washington and Rochambeau had surrounded Yorktown. Cornwallis received another message in late September from Clinton telling him help was on the way. Cornwallis was misled again and thought he only had to hold out for a few days. Just after the clash between the French and British fleets, a smaller French squadron carrying the French army's siege artillery slipped into the Chesapeake. 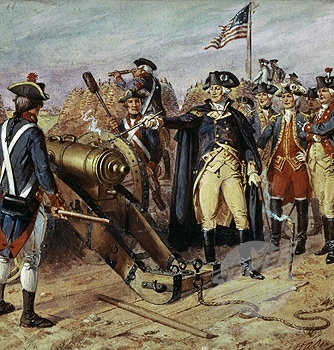 Now the French and Americans had bigger guns than Cornwallis had behind his earthen fortifications. Marching out of Williamsburg, Virginia the Americans and French arrived on September 28, 1781 at Yorktown. They surrounded the earthworks in a Semicircle with the York River completing the circle. Cornwallis made the first move, abandoning his outer works made up of four redoubts. While this seemed to be a major mistake to Washington and Rochambeau, they nonetheless moved to occupy the outer earthworks. The Americans and French began setting up their siege operations on September 30, first on the east side. By October 9, they were close enough to begin the bombardment. The Americans and French stormed two of the redoubts on October 14, forcing the British back even further. By that time it became obvious the British could not hold out much longer. On October 16, the British attacked two of the redoubts they had abandoned and spiked the guns. At the same time Cornwallis attempted to slip past the guards to Gloucester (now Gloucester Point, Virginia) across the river but was turned back by a storm. Finally, with no sign of relief as promised by Clinton, Cornwallis' army of 6,000 soldiers surrendered. The casualties were about 500 British, 200 French and 80 Americans. Captured were 240 artillery pieces, a large supply of small arms and ammunition, plus equipment. General Cornwallis did not attend the surrender. Claiming to be sick, he sent General Charles O'Hara to surrender for him. O'Hara first tried to surrender to Comte de Rochambeau. Rochambeau directed him to surrender to General Washington. In turn, Washington directed him to surrender to General Benjamin Lincoln who accepted O'Hara's sword. As the British stacked their guns marching out of the fortress, their band played "The World Turned Upside Down". When Lord North, the British Prime Minister, received news of the surrender he cried out "Oh God, it is all over!" While the Battle of Yorktown resulted in Cornwallis' surrender, the Treaty of Paris (1783) ending the war was still two years away. The battles Saratoga in 1777 and Yorktown in 1781 were two major turning points in the Revolutionary war. While both involved American victories over the British, they had two very different results. The British defeat at Saratoga prolonged the war while the battle at Yorktown is seen as the beginning of the end. But Saratoga convinced the French to join the Americans against the British. Yorktown was a joint victory by the French and the Americans over the British. The victory at Yorktown was honored in a 1783 medallion minted in Paris and designed there by US Ambassador Benjamin Franklin. Battle of Yorktown (1781) Facts for Kids. Kiddle Encyclopedia.